A friend of the office recently noted that we haven’t been discussing beer nearly enough lately. And it turns out she was right. After our office’s first, real recreational marijuana forecast last year and the Oregon Vice research and presentation I did, our office has been mostly focused on the evolving macro environment this year (more next week). Given this, and the fact that our office recently reconvened our marijuana forecast advisory group, I thought I should rectify the oversight. Let’s start first with an update to the comparison you never knew you wanted, but are now glad you have. 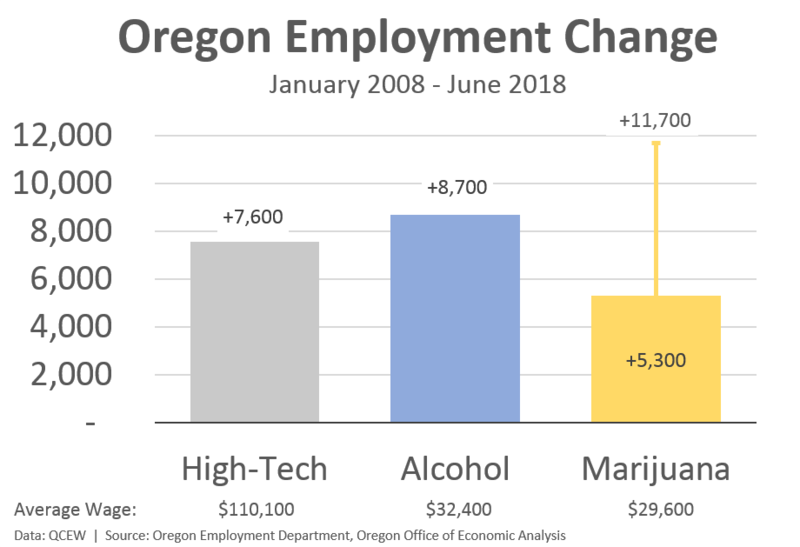 Over the past decade, or since the start of the Great Recession, Oregon’s thriving alcohol, and marijuana sectors have added more jobs than one of the state’s economic pillars: the high-tech cluster. Of course these economic sectors are not directly related, but instead are being used to help frame the discussion for just how fast, and how many jobs are being added here in the state. We use this chart regularly in our presentations to discuss a variety of legitimate economic topics, including the transition from hardware to software within the tech industry, in addition to the true economic impact from vice sectors lies not with the growing and retailing of the products, but in all the ancillary and support industries that grow along with consumer demand and evolving markets. At its roots, Oregon’s alcohol cluster is value-added manufacturing where firms take raw ingredients — many of which are locally-grown — and turn them into a much more valuable products sold across the state and increasingly around the world. Furthermore, a plurality of brew system manufacturers in the U.S. call Oregon home. So when a new brewery opens up elsewhere in the country, there is a good probability they are buying and using Oregon-made equipment. Our office’s hope is this type of cluster similarly develops around the recreational marijuana industry as well. Prices continue to plunge as the market matures and marijuana commoditizes. But increasing market activity in extracting oils, creating creams, making edibles in addition to hopefully building up the broader cluster of lab testing equipment, and branding and design firms, means Oregon will see a bigger economic impact from legalization. Note that the reason for the range of marijuana-related employment in the chart is due to data availability. Our friends over at Employment do a great job of matching employment records to OLCC licensed businesses. 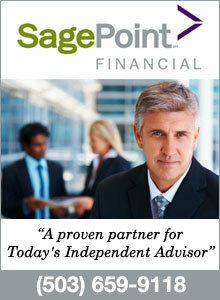 Their latest count totals 5,300 jobs in Oregon. Now, these are payroll jobs (technically jobs subject unemployment insurance). Given harvest seasonality, part-time work, independent contractors and the like in a still federally illegal industry, it is reasonable to expect these payroll jobs to be more of a lower bound. However, if we turn to OLCC marijuana worker permits, those currently number 36,000 which is too high. Triangulating a more reasonable estimate — either via a rough sales to employee ratio, or scaling by a similar factor as food handler cards to food service jobs — shows there are probably about 11,000 or 12,000 marijuana-related jobs in the state today. Finally, I have also been updating my Oregon brewery production numbers to track start-ups, the state’s legacy breweries, and also closures or failures. Given the outright declines in the beer industry overall, and slowing growth in craft beer sales, there has been quite a lot of hand-wringing over what it means. No doubt, retail shelf space is limited and the competition is fierce. Some breweries are seeing substantial declines in their sales and production. However that does not mean the industry overall is unhealthy. In fact, brewpubs continue to thrive, and some of the bigger breweries are revamping their tasting rooms, and adding more locations for better direct-to-consumer sales given they maximize revenue per pint this way. Elon Glucklich at The Register-Guard has great article on this, with a focus on Eugene breweries. However, as Warren Buffet said, “only when the tide goes out do you discover who has been swimming naked.” For breweries this means that business plans, practices and operations matter considerably more in a world of slowing growth then they do during the go-go days of double-digit gains every year. Slower growth can strain business finances, eventually leading to more closures or failures. So, are we seeing this here in Oregon? So far the answer is no. Yes, the absolute number of brewery closures has risen in recent years, but the closure rate has barely budged. The reason is Oregon has quadrupled the number of breweries in the state over the past 15 years. As such, we should see more closures given there are so many more potential places to run into issues — be they low sales, high costs, personal problems, or the like. 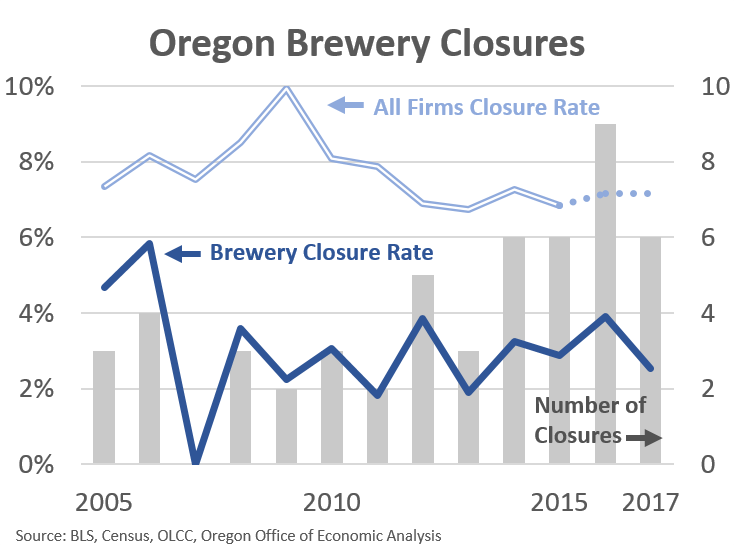 To date, Oregon breweries are closing at a significantly lower rate than other types of businesses across the state. Next week I will have a few posts on the macro outlook, as we meet with our economic advisors to nail down the 2019-21 biennium outlook. Our forecast will be released Nov 14, at which time we will also have an updated recreational marijuana forecast that incorporates all of the latest data and input from our advisors. Last but not least, a special thank you to Beth Dyer at Employment for helping me get all of the industry data to build the clusters!